Prep well to remove the Thompsons and stain with the 200 Series in one of our colors for a longer UV protection over the Clear. I had my deck stained (professionally) 1 year ago with combo 5 gal 207 (butternut) and 1 quart 1503 (dark oak) - i know you say 100 or 1500 are better for decks. Is it ok to restain with the same colors and still use 207 as the primary stain? Or should I use a different product? You can use the same as last time. The 200 can be used for decks. I am in Canada and somehow I managed to get the 1500 product about 3-4 years ago. Is this still possible? If not, is is ok to put the 200 product over the 1500? Thanks. 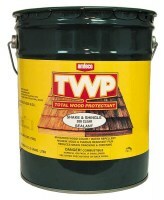 The TWP 1500 is not allowed in Canada so it is not legal to be used or shipped there. As long as your prep correctly, you should be okay. I have a log home in Nova Scotia Canada and I have always used the Cedartone 101; is the 201 compatible in colour and durability? How much is the shipping Nova Scotia or can I buy it locally? TWP stains are not sold in any Canadian stores. You will have to order from our website. For shipping and total cost, please add to cart and enter your shipping info. The TWP 100 Series is not legal for Canada's VOC laws but the 200 is. The colors vary slightly between series. We only carry the 200 Series in 5 gallon pails. I want to restore 22-year-old cedar-shingle siding. I will clean and brighten, and then I want to use TWP 200 series. Your product data sheet says not to apply below 50 degrees, and it cautions to "allow to dry for a minimum of 48 hours." Does this mean that temperatures must stay above 50 for the entire dry-time? It can drop below 50 while curing but it cannot drop below freezing. It will also take a little longer to cure in colder temps which should not be an issue for vertical shingles. Is there anything that can be done about the color fading? I used Russet but it is turning more a tan color. It is normal to fade through the years. Just prep with the Gemini Restore Kit and recoat with the Russet to restore the color. 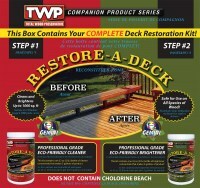 You would need to prep with the Restore A Deck Stripper Kit if you want to switch. There is not a matching color for the TWP Cal Cedar in the 100 Series. I have used series 200 (cedar tone 201) on my cedar shakes I am in need of another 2 gallons. Does series 200 come in 1 gallon sizes? Sorry but we only sell in 5 gallon pails.